We all get annoyed at our colleagues, the rules, terms and conditions of employment and the actual work we have to do at some point, but depending on how strongly we feel about something or how we react to it will determine how much it is going to affect the rest of our life. Most of us will admit to getting frustrated and even feeling anger sometimes whilst we are at work, but what is important is how we manage this anger.Sometimes it is enough to go away and discuss the issue with someone unrelated to the environment whilst others find a good old moan with their colleagues is enough to make themselves feel better. There are a small number of people however that do not vent their anger in this way and will allow it to build and release itself inappropriately. The person usually on the receiving and of this behaviour is most often the person closest to them. This may be dangerous as it can fuel an argument or lead to violence, especially if the person does not understand what exactly your role at work is. If you feel so strongly about something that it is affecting your home life and endangering your relationships or even the welfare of others you must make an appointment with your manager (or their manager) to discuss work-related issues and express exactly what it is that is bothering you. If you are feeling so angry that you may lose control of your behaviour you may want to see your GP to discuss your options and discover if there are any anger management classes in your area. If you are the senior member of the team and have observed or had reports of angry behaviour about an employee you must investigate these claims. If there is anger within your department, employers and managers have a responsibility to safeguard their employees from harm and this includes protecting them from a person known to be a possible threat. If you are aware of any anger or conflict in your department, deal with it as soon as you can as this shows you have a genuine interest in the issue.Calm the person and do not raise your voice as this may anger the person further.Try and find out how they are feeling and what made them feel this way. Ask if they have any suggestions on how the situation may be improved and give them some responsibility over making any changes. Try and find a compromise. If you are going to discuss these problems with the employee always remember to take a third person to the interview as a witness and note taker.It may be worthwhile undertaking a conflict resolution course which teaches managers how to deal with such situations as this and how to make positive moves to manage the situation. If necessary refer your employee to the occupational health department (if you have one) or suggest they see their doctor to discuss their anger issues and seek help and advice from a senior manager.If you believe a person may be a possible threat whilst they are at work, as an employer you may want to either send them home or suspend them until they have resolved their issues and received treatment for their anger. 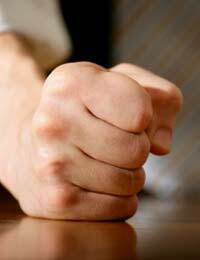 Angry employees must be dealt with before the situation is permitted to escalate. If you are an employee and are feeling angry either discuss these issues productively with your manager, discuss them with a friend or colleague but understand that this simply allows you to vent your feelings and will not make any change to the situation. If you are feeling regularly angry and are beginning to notice a change in your relationships or behaviour and feel you may ,lose control, please see your GP or a counsellor who may be able to provide some useful anger management strategies for manage your anger more effectively and in a less detrimental or risky way.